These pictures are of day1 when we reached for a destination wedding. This has been by far, the most grand wedding that I have ever attended. Lot of Bollywood singers were on the stage. There were about 8-9 functions, parties, dances, huge array of food. In the upcoming blogposts, I will post more pictures and descriptions. What I wore was a Manish Arora suit, that I have previously worn here, here, here and here. 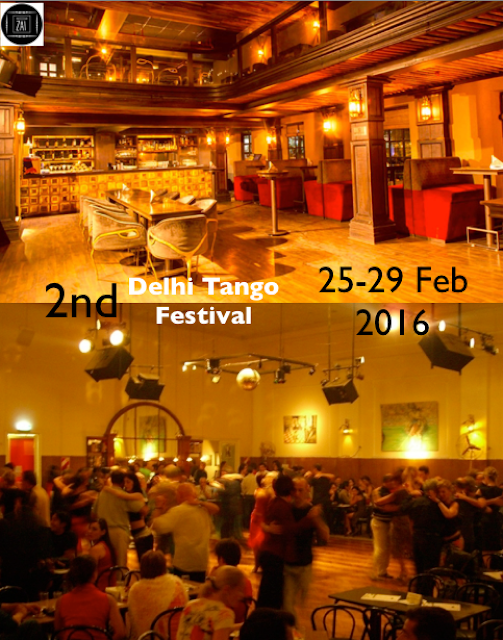 Last year many tango lovers from more than 10 countries came to Delhi to enjoy magical unforgettable nights and days. In our second year of the festival, we are getting more passionate and energetic with your support. Tango surrounds our lives, we live it with the most amazing maestros, orchestras and DJ’s of the Universe where we bring on together in Delhi, which is one of the most beloved and historical Cities in the World. Join and share the magical moments with us, we promise your Tango journey will be an unforgettable one. *Amazing Milongas in significant venues. *Opening Milonga in the American Embassy. Grand Finale in one swanky restaurant with wooden floor and the feel of Buenos Aires complete with old world charm and lamp shades. *Tango footwear and clothing collections. *Special Accommodation deals for festival participants in the heart of Delhi. *This year all classes will be in main NDTS studio. *Studio to milonga venue is walking distance. Of course, tango is the focus of our festival. But as the slogan "three days of passion in mystic India" implies, we think that India should take the lead, so that you can follow the sound and rhythm of this wonderful place. Right after the Tango festival, Delhi sees World Culture festival. Spread over a venue of 1000 acres and expected to be attended by 3.5 million people from 155 countries, the World Culture Festival will be one of the biggest cultural gatherings in the recent times.Besides the big gamut of vivid cultures on display, there would be keynote addresses by luminaries, an interactive leadership forum, an inter-faith meet to boost humanitarianism, guided meditations, and musical and dance performances. The grand spectacle will witness a multitude of dancers, musicians, religious leaders, eminent personalities and people from all walks of life come together to celebrate our enormous diversity. To ensure an even mix in the Tango festival, make your reservations as soon as possible, as we are taking limited registrations. Apart from the performances by our featured Maestros, you will also enjoy amazing live band duo performance. As one of the famous Argentine tango instructors says: “The music is the leader.” That is why we have invited well-known DJs, who bring their experience from numerous international tango festivals. With their festival-tested tango selections, you can be sure to dance joyfully. So we hope to see you in end of February, the best time of year in Delhi, where we can tango together into the spring! 1. A leader walks up to me and extends his hand to ask me for a dance. 2. A leader walks across the room/dance floor, to get me or to give me a cabaceo few feet away from me. 3. A leader verbally asks me for a dance. 4. Follows me to the bar, sits next to me to asks me for dance. 5. Taps me on my shoulder to ask me for a dance. In all the above situations, do I say yes or do I say? To be very polite, sometimes I say, Okay, I will dance only one song and not full tanda (3-4 songs). That should convey the message- I hope. Leaders if you want to ask a follower for a dance in a milonga, apply cabaceo. Do not persist or get offended. Everyone is there to have a good time in a milonga. There should be no obligatory dances. A beginner horse gets a beginner rider and the advance horse gets an advance rider. Improve your skill set of tango. Take lessons and privates. Smell good. Have breath mints. Dress well. Wear nice tango shoes (Long, pointed toe shoes or sneakers are a no no). Do not sweat. If you do, have a handkerchief and change of shirt ready. Do not pull, push. Have a nice embrace, listen to tango music. Just because you can do few STEPS, you do not earn a good tanda with a good follower. Note to followers- Be a snob. No shame in that. Accept dances from a leader who is good. See whether he deserves you. Do not trust him. If you trust him, he will fail you. One look at him, should be enough to tell you that you should not trust him. But shhh! he cannot know. If he knows, he will be very upset. Like Argentine woman of earlier times, be on alert, 24/7. She must be self confident, pretty, assured, not worried about doing anything wrong. She can only be right. If he misbehaves, you say, "no dear. You may do this to other women but with me, you will behave." Women does not surrender. She takes charge. Your job is- beauty, form, shape, feeling, embrace, relationship. Tell him, "come to me". But Shhh! he cannot know. He must interpret your control as your desire for him. Being in control of a relationship is follower. Good follower can make anything she wants out of a bad leader. A good follower knows how to dance independently and rather even make her man look good. She does not wait for the lead because she knows that the leader is an idiot. One look at him is enough to tell her that he is an idiot. That she should not rely on him. That he will fail her. Let him believe that he is the man of the universe. That he is making her look good. Let him take the credit. If he tells her- you are wrong, then she says, 'Yes Dear' and then does exactly what she wanted to do. Strengthens the back and the core. Stretches the chest, neck and shoulders. Stretches the hip flexors and the quadriceps. Do not practice if you have high blood pressure, shoulder injury, neck/cervical pain, migraine, hernia, recent abdominal surgery or if you are pregnant. This is a good stretch for hamstring, hip flexors and lower back. These muscles need to be stretched after walk, run, aerobics, dancing etc. This is a gentle stretch that can be a part of your cool down. It is always beneficial to increase the range of motion. Stretching helps to avoid injuries and reduces post workout soreness. Pushups are one the best exercises to tone and sculpt your upper body without any equipments. These help you to build and strengthen the muscles and are a must for any athletes training schedule. They target triceps, pectorals and core muscles. You can do them at any time and any place. You can easily modify them to suit your level. You can do wide grip pushups or narrow push ups, you can keep feet elevated or do wall push ups or on the gym ball. Do try to go as low as possible and touch your chest to the ground. With practice, you will be able to add more repetitions and sets. If you want beautiful and shapely arms, pushups are mandatory. There is a belief that the embrace of tango has other intentions beyond mere dance. What goes through the body in those early stages when we embrace the other before starting to walk together on the musical track? What happens in dance when that embrace melts? Let us know more about the embrace of tango- truths or myths. Embrace in Tango - Tango and milonga experiences are not transferable, no one can tell or explain to you what they feel when they start moving in an embrace on a particular tango music. The language of tango is very peculiar and only those who dance, know that hugging is part essential to speak this "language". 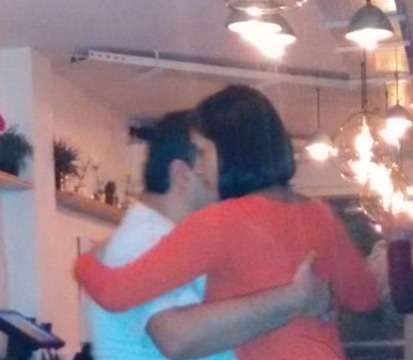 Those who start dancing tango are initially scared to take a class or go to a milonga and to embrace someone unknown. They have inhibitions initially, but once you start dancing, shame disappears and you embrace this code which is rife amongst milongueros. To hug a stranger initially is difficult specially if you have grown up in the culture of "do not talk to strangers." 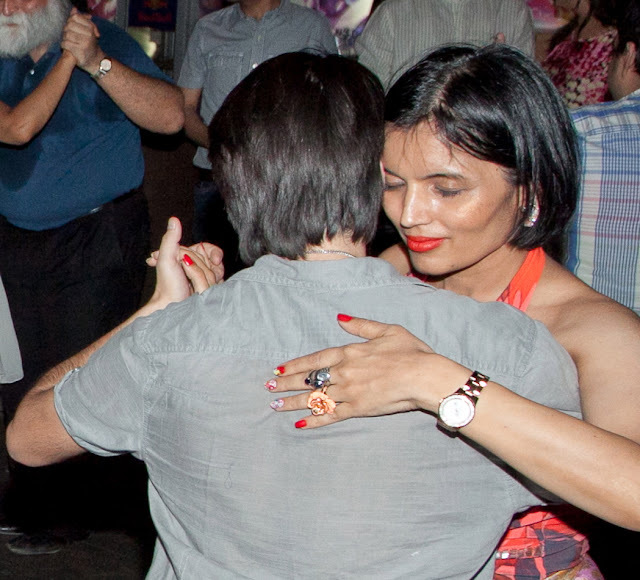 But the milonga is a game where it not only "worth" it, but rather it is essential to be part of this world. Dancers do not have any myth that hugging has other intentions. Well, we are not innocent, yes, some of it may have. Embrace is similar to a hug like in an office or on the street or in other contexts. When one embraces, there is no direct physical contact, which brings the bodies close. But there are no sexual intentions either. Those who engage in the dance have the sense of touch more developed, and head open enough to understand these new languages ​​that are so subtle as virtual, where there is this physical body, yet are very powerful to communicate . After researching in the milongas on the embrace and intentions, when I asked people why they danced, most replied that they dance for fun, to improve their dance to connect with your body pleasure, to enjoy, to learn, to disconnect from the world, for personal challenge. In addition, we know that for milongueros, every hug is unique. There is definitely some space left between the two bodies in an embrace. That space creates an intimacy impenetrable for those outside hug. There is no single way to embrace in tango. The important thing is that the dancers can be united and create a certain complicity between each other. It is the way the bodies unite and allow communication. It is important to conform to the other, because each person has a way of embracing and the combination of the two will create something unique. Hugging is an area of ​​mutual reciprocity, which is shared, is built and modified in the same dance. You can change shape and contact. The important thing is not to lose the connection. Tango experience is often referred as Bliss. It is no coincidence that tango connection makes a person reach sublime pinnacle. Amongst all other dance forms, tango seems to unique in its experience. It is often called addictive and alluring. What is it about tango that two individuals with different mindsets, two strong personalities, come together and merge as one? They seem to have same mindsets, they communicate silently, they share the axis, their heartbeats become one, intention of one partner is clearly understood and responded by the other. They move together like one animal with four legs in a close embrace, improvising, embellishing, imagining, smiling and becoming lost in exalted encounter. They become two bodies with one mind, one heart and one soul. There seems to be this paranormal, mystic and occult fusion of two bodies, the dynamics of which is beyond human comprehension. 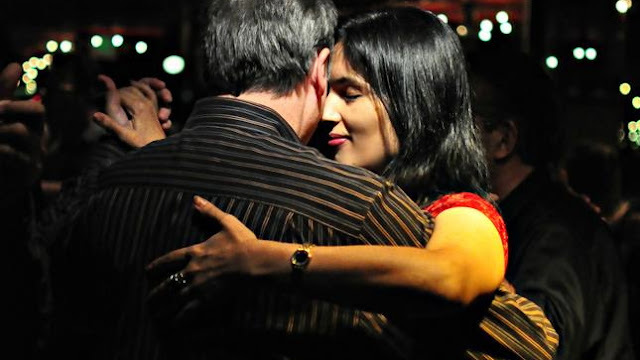 Most of the tango dancers are addicted to this feeling of unexplainable bliss, the connection, the musicality, the meditative mode that they experience during each dance. This is the moment when time and space dissolve. Tango is seductive, flirtatious, graceful, artistic and exquisite. Lot of scientific research has been done on tango experience that remains a puzzle for many. Human mind has an unlimited prospective to learn. There is scientific evidence that proves that to develop skills for social dancing, the kinaesthetic awareness is heightened. It is the sensory skill that body uses to know where it is in space. The nerve receptors which send specific information to the brain are definitely functioning better in a tango dancer, as compared to a normal individual, which makes tango dancers more aware of their space. The brain of a tango dancer has inadvertently learned to move backward without knocking down things, to identify the edges. There is heightened awareness about impetus and extra senses in action. Human minds and bodies adapt and respond pretty quickly.Whenever you work with a particular object continuously, it becomes an augmentation of your own self. For a pianist, a piano feels like second skin, a violinist knows his violin like a back of his hand. Similarly, there is scientific evidence that shows that for tango dancers, another body is like an augmentation of their own self. Here two bodies, four feet move simultaneously on the same beat. Tango is not just a dance form. It transcends beyond. It is meditation in motion, it is connection and relationship between two individuals and embodies time and space. It is romantic, spiritual and profound. Hey Delhi people! Are you gearing up for this super exciting Tango festival happening in your very own Dilli? Whether you are dancing/learning tango or you are a beginner, do not miss this opportunity to take lessons and be a part of this fun filled 3 day festival. You can see the pictures of the first festival in the gallery. Roberto Massis is an Argentinian. He started dancing since 1977. After he discovered his immense attraction for dancing, Roberto emerged in dancing as his passion and professional career. Elise Audras is born in a little village named Etoile sur Rhone (Etoile means “star’ in French) in France in 1974. She started Classical Ballet in 1979, and moved to Modern Jazz and Contemporary in 1990. Roberto and Elise met in Jordan. The beautiful connection between Roberto and Elise incited them to share their passion for dancing. Elise joined Roberto as his Dance partner, both in Latin dances and Argentinian Tango. Roberto and Elise teach and perform in Europe. They are both passionate about teaching and performing. Students of their classes enjoy learning about musicality and music interpretation. They fully understand how to create the connection with the partner, deeply feel how their own body works, and achieve movements in a smooth and fluid way. They know how to create variations around a step, how to manage the space on the dance floor and improvise, while being able interpreting the Tango music more easily for a joyful moment of dance. Students can expect detailed information about Tango technique, encouragement to exceed their own limits and personalised feedbacks, in a welcoming, enthusiastic and friendly environment. Roberto established Argentine Tango in Jordan in 1998 and in Palestine in 2010. He founded Roberto Dance Academy in 2009 in Amman. Jorge Richards is a musician and tango instructor from Panama City, Panama. He started his musical studies as a young teenager with classical guitar. Tango came in the late 2010 to Jorge’s life by the hand from a devoted teacher that had just returned from Buenos Aires to reunite with her family, and quickly became a long life passion. While working and studying a engineering degree Jorge had to strive to fulfil a strange calling that arouse from the Tango classes, and finally visited Buenos Aires in the year 2013 to know the real milonga landscape and study Tango guitar from the original source. Upon returning to Panama Jorge got together with some friends to start the TEP (Trio Experimental Panameño) to perform live tango in the Panamanian milongas in order to bring more people interested in dancing. After many years of dedication, Jorge’s tango teacher had to leave to country in 2014 and he took the responsibility of keeping the tango community alive and sharing the knowledge of empowering people through Tango in a country in which not tango, but Salsa is the mainstream social dance. However Jorge’s cultural heritage could not be avoided the tango and salsa dancing got mixed up into a new and playful Salsango style that is fun and easy to grasp, given that you know Salsa and Tango. After many years living in Panama, Jorge left the country to travel to Europe and India, looking for new adventures. Back in Texas, his father would take the family to Spanish language outdoor cinemas and among that potpourri of films were included some of the classic Argentina tango films. It was at the University of Texas that he began to study yoga and had his first exposure to Zen Buddhism. He engaged in a study of various dances. He eventually received a degree in Philosophy with a concentration in Epistemology. He began to apply various psychological methodologies to help students overcome mental blocks in learning to dance especially the classical “performance anxiety”. To this key problem he began to reflect on how certain psychological approaches might assist in this endeavor; in particular those of Carl Jung and Rudolf Steiner. He began to apply certain principles of Zen Buddhism like breathing and visualization, being in the present, meditation. Mr. Wright reflected on how key concepts of physics might explain and assist in attaining excellence in tango movement. This included Einstein’s theory of relativity, both the special theory and the general theory to give insight into a tango movement in a period of space and time. “how does one attain self confidence”. Over the years, his Zen Tango evolved into a successful method eliciting comment like, “I had tried a number of times to learn tango with other teachers finally succeeding only with you”.. In the fall of 2013, while dancing at a milonga in Rome, in the audience happened to be the reknown Argentinean orchestra leader and composer Armando Kreiger (friend and acquaintance to some of the legends of tango like Astor Piazzolla). They soon became friends and Maestro Kreiger invited him to do a series of performances with the dance company of Arena of Verona and eventually (c. spring of 2015) to do a performance at the legendary Teatro Colon of Buenos Aires of which he is musical director. we are already dancers inside…. Technique and Musicality in Milonguero Style - Emphasis on Rhythmic Tangos employing turns. Technique and Musicality in Salon Style - Emphasis on Romantic Tangos and the quality of the pause. Technique and Musicality in Nuevo Style - Emphasis on Dramatic and Modern tango with possibilities of style mixing. 3. Musicality/Fast and slow dynamic. Management of orchestras. Understand & Feeling of the music & its Melody. Align your emotions & energy with the music rhythm. Exploring the possibilities that different orchestras offer. Action from beginning to end, the purpose of this class is to develop awareness about the movement of energy in the tango dance. Many partners exercises, games and sequences designed to increase perception and sensitivity and apply it to the Tango Dance. then we move the torso - perpendicular: clean movement, essential…always seeking that magical perfect equilibrium. Connection with partner & embrace. 3. Vals musicality & dynamic. Musicality and Dynamic Turns for Vals. Spicing Up Your Vals: Creating Contrasts with Different Qualities of Movement. Challenging Rhythms, Syncopation and Beyond. 4.Crash course on Tango Music Theory and how to use it in our Dance. Basic knowledge about music theory and the Tango Music. This class is focused on recognizing musical patterns as means to improve the interpretation and musicality of the dance. Heraclitus - ”all existing entities are characterized by pairs of contrary properties"
2. Tango Meditation. A touch of Yoga to our Tango practice, or backwards? A workshop aimed at consolidating the knowledge of the previous classes in an attempt to experiece union and intimate conection in the tango embrace. How can it feel like to have 4 legs? Linear, Circular and Continuous Colgadas for Open and Close Embrace. Challenging Combinations! Mixing Colgadas with Barridas, Sacadas and Ganchos. The legs may be interlaced and hooked together, in the style of Octopus. Sequence step: Trap Sacadas, Wrap Sacadas, Drags, basic Ganchos. Find your balance, pivot & connection. Evening snacks and soft drinks will be served to all the participants. Grand Finale Milonga on 28th with performances by Maestros. Venue: Zai, Local shopping Complex, Greater Kailash-2. Wines, snacks and dinner on the house. There are many hotels in Greater Kailash-2. All are walking distance from milonga and workshops. The area also has many bars, coffee shops, restaurants and banks. Disclaimer: Do your own research. Organiser takes no responsibility for these hotels. We have no direct tie up with any of them.